Presented by Red Brand Fence. Mike Penna and Jude Feld broadcast live from our Jimmy John's of Lexington studio. Special guests include Country music superstar Toby Keith, Woodbine CEO Jim Lawson, Trainer Catherine Day Phillips, jockey Drayden Van Dyke and our "Industry Star of the Week" presented by Stuart Morris. Presented by Red Brand Fence. Mike Penna and Jude Feld broadcast live from Saratoga and look forward to the Travers Stakes. Special guests include Bob Edwards, Tim Wilkin from the Albany Times Union, Vinny Viola, owner of Travers contender Vino Rosso, Pete Rotondo from Breeders' Cup and Eric Barlund from Tito's Handmade Vodka. Presented by Red Brand Fence. Mike Penna broadcasts live from our Jimmy John's of Lexington Studio, and looks forward to the Alabama Stakes and the Pacific Classic. Special guests include trainer Ken McPeek, Jeff Bloom from Bloom Racing, and Craig Dado, DMR Exec VP & Chief Marketing Officer. Plus, interviews with trainer John Sadler and Brent Elliott, Master Distiller of Four Roses Bourbon. Presented by Red Brand Fence. Mike Penna and Jude Feld broadcast live from our Jimmy John's of Lexington studio and look forward to the Arlington Million and Fourstardave. Special guests include	Stuart Fitzgibbon from Castleton Lyons, Alastair Donald of the International Racing Bureau, Trainer Brian Lynch, and Doug Dearen from Derbybox.com. Presented by Red Brand Fence. Mike Penna and Jude Feld broadcast live from Saratoga and look forward to the Whitney Stakes, Special guests include Jim Gluckson from Breeders' Cup, Headley Bell from Mill Ridge, Trainer Ian Wilkes, Trainer Rick Violette, Owner Ken Ramsey, and Pat Costello from Paramount Sales. Presented by Kentucky Downs. Mike Penna and Jude Feld broadcast live from our Jimmy John's of Lexington Studio and look forward to the Jim Dandy Stakes and other Saratoga races. 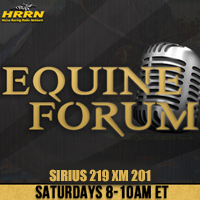 Featuring interviews with Todd Pletcher, Chad Brown, and Steve Asmussen. Special guests include HRRN's Acacia Courtney, Consignor, Chris Baccari, and jockey, Rajiv Maragh. Presented by Kentucky Downs, Mike Penna and Jude Feld broadcast live from the Jimmy John's of Lexington Studio. Special guests include Frank Stronach, Claiborne Farm President Walker Hancock, C.J. Johnsen from Kentucky Downs, and Del Mar Vice-President of Racing Tom Robbins. On this week's show, presented by Kentucky Downs, Mike and Jude are live at Fasig-Tipton to preview the July "Horses of Racing Age" Sale. Guests include Tom VanMeter, Max Hodge, Conrad Bandoroff, Stuart Morris, and The Big A Anthony Stabile.